Drop in to Mint Museum Uptown to have a hands-on experience with clay! Enjoy demonstrations from Clayworks in the atrium from 2-4 PM and try your own hand in the studio from 1-4 PM. Today’s theme is “Fun with Pinch Pots.” Join our teaching artist in the studio as they demonstrate how to make a pinch pot. 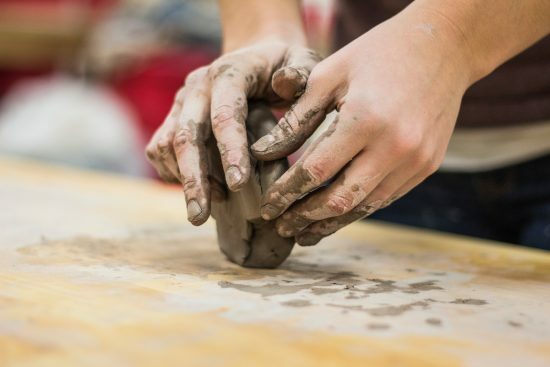 From simple pinch-pot monsters to a closed form made from multiple pinch-pots, participants will learn basic skills of how to slip and score and manipulate clay to create whatever they can envision. In the atrium, artist Kira Campbell demonstrates techniques and brings clay alive for the whole family. Offered in conjunction with the exhibition, Michael Sherrill Respective. While this event is free, general museum admission fees apply.